“This was the first Tiger to arrive in Pittsburgh, PA, where I lived at the time. I knew it was coming and bought it as soon as I saw it on November 4, 1964, from West Liberty Motors on West Liberty Avenue in Pittsburgh (they sold Alfa Romeos in addition to Rootes Group products and are shown in the Book of Norman as European Cars, Inc.). I was young and single, driving a TR4, but I wanted a Tiger so I traded the TR4. The Tiger became my daily transportation in and around western Pennsylvania, New York State and West Virginia. I worked for a large company and traveled to clients’ offices in the area, so most of my travel was long distance, not commute. From the beginning, the Tiger has been comfortable, reliable and fast, but it needs a gentle touch. I moved to Northern California in January 1967 and the Tiger moved with me, traveling in a Bekins enclosed van paid for by my new employer. I registered the car when I arrived and received the black license plate it carries today. I have moved around the Bay Area and Sacramento a few times but the Tiger has rarely seen snow since I don’t ski or like cold weather. The Tiger was perfect for our new home in California and remained my daily transportation for years, even after marriage and the addition of children. I have always been a car buff, built a couple hot rods as a teenager, and one day I bought a ’57 T Bird in need of restoration. Slowly, the Tiger started getting phased out and the restored T Bird took its place as my daily driver. My kids drove it occasionally, but they now had their own cars and the Tiger needed its own restoration. In the early 1990’s, I took the Tiger apart and restored it. I did much myself, but farmed out the skilled work. Joe’s Foreign Automotive in Walnut Creek had serviced the car for years so I had them pull, rebuild and re-install the original motor while they refreshed the drivetrain. I had the car repainted the same red by Larry Middleton (Hayward Metal & Paint) and re-upholstered by Mike Murray (Custom Auto Upholstery in Manteca), both of whom had done good work for me in the past and both of whom have done more cars for me since; some of those cars have won awards. Most of the chrome plating was done by Hi-Lustre in Hayward. More recently, Central Automotive in Walnut Creek has done a complete refresh; I chose them because they have done lots of work for me and they have worked on lots of Tigers. I did the restoration research, parts chasing, detail work, etc. Most of the new parts I bought from Rick McLeod of Sunbeam Specialties, although some came from Norman Miller, who authored “The Book of Norman” and from others. Rick and Norman were very helpful, as was Blackhawk Museum, which had a black Tiger on display that was built at almost the same time as my Tiger; they allowed me full access to that car to photograph it in detail, which really helped me with my restoration (those photos are with the car). I also bought an Alpine parts car for the restoration–that car later went to England for its own restoration! Over the years, I accumulated some original parts that had not come with my Tiger, along with a few LAT option parts. No hardtop was available when I purchased my Tiger, but I found one shortly after I arrived in California. It was new and un-used, said to be one of several in a crate that had been damaged off-loading at the Port of Oakland, where I bought it. I also bought a clock new and un-used, but never installed it. Clocks are very rare and valuable but they are still just clocks. My Tiger also did not come with sun visors; in fact, I did not know there were such things for this car until I restored it. I found an original pair in good shape, but I never installed them although they are with the car. My Tiger did come with seat belts; they are with the car and need restoration. The original mirrors that came with the car are there along with a set of replacements I bought from Sunbeam Specialties, but I could not bring myself to pierce the new paint on the restored car, so neither set of mirrors is on the car. As is now evident, I have not driven the car more than a few miles since I restored it! I did find a pair of original LAT 70 wheels, on another Sunbeam that I bought to get the wheels (I now wish I’d kept that car as well!) and I found the LAT 70 Edelbrock carb and manifold option that is now on the car. I kept the original carb and manifold, which are also with the car. As I mentioned before, Tigers require a light touch. This car has never had Traction Masters on it, which makes it one of the few Tigers that have not had them. Any Tiger with Traction Masters has been pushed too hard, causing rear wheel hop and damage. I learned early on NOT to tromp the throttle and that lesson has kept the car’s drive train in very good shape, even though the odometer has turned over once. I have never had an accident with the car, but one rear fender was damaged while parked by a hit-and-run driver. I bought the Tiger to drive and enjoy, not to sell a half-century later as a collector’s item, so I did not keep the receipts or other documents collectors seem to prize. What I’ve written is from memory, but I would be happy to answer any and all questions you may have! This car retains the majority of it’s original parts including steering wheel, engine, transmission and rearend. This car runs, drives, and looks excellent. 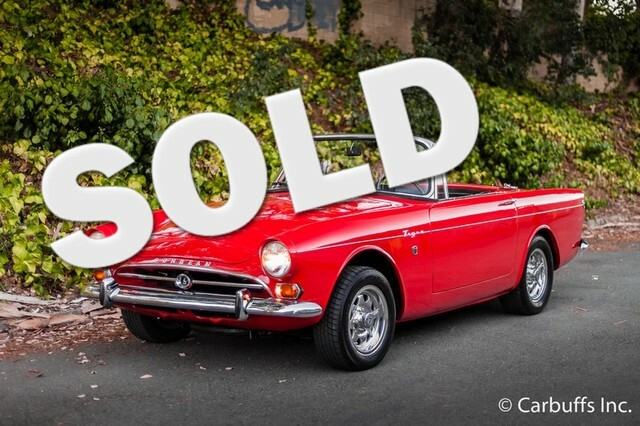 Certified as real by the Sunbeam Tiger Owners Association. Currently registered. Clean California title.